Clyde first achieved infamy with a Houston based comedy/musical act called The Gonads (later renamed The ‘Nadz for obvious reasons). He later worked with other local bands before moving to London in 1987. It was here that he married and enjoyed a successful and diverse musical career. In addition to a substantial amount of session work, radio shows and television appearances, he recorded and toured with a number of international acts including The Damned, The Phantom Chords, Marc Almond (Soft Cell) and The CIA (consisting of members of The Kinks, UFO, Eddie & The Hot Rods and Dr. Feelgood). He also took some time out to work on his own projects, most notably Lodestone Kick, a London based rock band. It was while collaborating with this group of musicians that Clyde was able to fully utilize his song writing skills and together they released two CDs. Clyde returned to the US in 1994 but continued with his UK projects, commuting between the two countries for a few years. 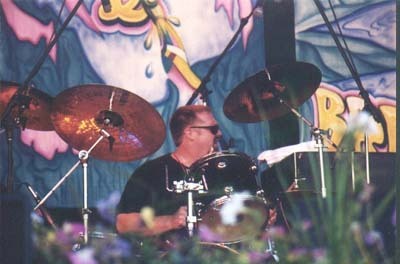 Before joining Mark in 1998 he played with respected Blues act Luther and The Healers and the notorious Miss Molly and The Whips. In his spare time, Clyde works on his solo project and is currently in the process of making a CD.